Imaginative monologues by key characters in the Passion and Death of Jesus captured the hearts of the audience at a locally-devised and produced play at St Mary’s Church, Palmerston North, on Passion Sunday, March 28. Emma Dodson wrote the script and, while remaining faithful to gospel accounts of the triumphant entry into Jerusalem and subsequent events through to Jesus’ death, she interspersed the gospel narration with monologues by key characters, giving glimpses of how they viewed the events happening around them. It was these moments that really captured the audience – the merchants in the temple complaining about Jesus’ erratic behaviour, the High Priests plotting to get rid of Jesus, the women in the courtyard gossiping behind Peter’s back, Pilate wondering aloud how he could avoid sentencing Jesus to death, a soldier wondering about her work in the midst of the flogging and Simon talking about having to carry the cross. The mood became more and more solemn as the soldiers in NZ Army garb with toy AK47s treated Jesus mercilessly, dragging him on and offstage, throwing him to the ground, even slapping him across the face which earned a few sympathetic gasps from the audience. Possibly the most powerful scene was the scourging at the pillar where the cast crawled up from the floor to crouch around the front, pointing violently at every stroke of the whip, while eerie music played overhead and Jesus slowly sagged, until it seemed like the only thing holding him up was the rope around his wrists. The performance raised $500from gold coin donations for the Caritas Lenten Appeal and there have been requests to tour the play around the diocese and even a suggestion to have it at the Regent next year. 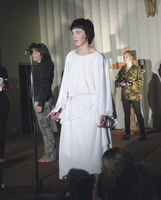 A year 13 student at St Peter’s College, Richard Grzyb, seemed born to play Jesus. Isaac Harris, also at St Peter’s, and David Chisholm worked well together as the scheming high priests, while Rick Field was a compelling King Herod. Matthew Kearins as Judas, Paul Jorgensen as Pilate, and Lydia Boon, Ryan Knighton and Angela Quigley as soldiers also gave great performances. Above: After the scourging: Tracey Bromell, Lydia Boon, Ryan Knighton, Paul Jorgensen, Richard Grzyb, Isaac Harris and David Chisholm.